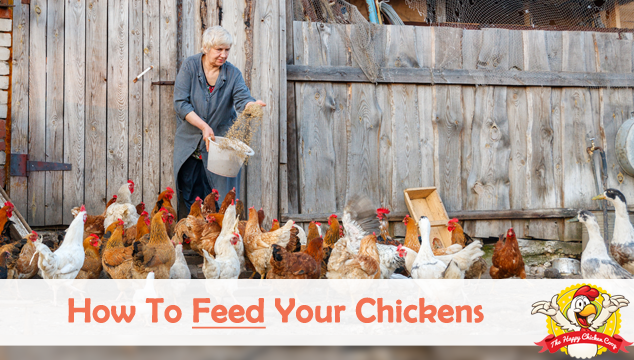 Feeding your chickens might not be something which you pay too much attention to, but did you know that seventy percent of the cost of raising chickens goes toward feed? Therefore it stands to reason that you need to pay attention to what you feed your birds. No one chicken is the same as each breed all require slightly different mixes of nutrition, as do laying birds or meat birds. Let’s start at the beginning and work our way through the ages, types of chicken and look at exactly how you should be feeding your chickens. As with humans and other mammals, chickens need a slightly different nutritional input as they are growing. We have set out the suggested feed requirements very briefly below. Young chicks need more protein in order to grow rapidly during their first few weeks of life. Please note that most, if not all, feed producers have a table on the back of the feed sack to give guidelines for appropriate feeds. Broiler (a chicken breed for meat) chicks are required to put weight on fast, ready for slaughtering at around fourteen weeks of age. Their feed is high in protein to enable the chick to develop and put weight on rapidly. For the first three weeks they are fed broiler starter, which is 22% protein. At four weeks old they are changed to finisher feed which contains 19% protein. Layer chicks get chick starter feed up to six weeks of age- chick starter feed is normally around 20% protein. They still need higher protein, but are growing less rapidly than the broiler chicks. At six weeks they are then changed over to grower feed which is 17-18% protein until about twenty weeks. A high level of protein is required at this age for the bird to fully develop into a good layer. At twenty weeks or so, they can be changed over to layer ration which is 16 -18% protein. At this age, your pullets should be thinking about laying some eggs for you! My girls will then then stay on layers ration permanently. It is very important that the correct feed is given to your layers since the calcium requirements are different from chick to pullet! You can feed older birds higher protein feed and offer up extra calcium by way of ground oyster shell or crushed eggshells, but you should not give younger birds’ layer ration. Layer ration contains a higher level of calcium than they need and too much calcium at a young age can lead to kidney failure. As you can see, from the perspective of protein and calcium requirements alone, it would be a daunting task to mix your own feed. Chickens require thirty eight separate dietary nutrients to be in the best of health! Feed companies have animal health nutritionists to work out formulae for any number of animals at any given age. Poultry is no exception. The feed they produce has been scientifically formulated, is a complete nutrition and reasonably priced to give you the best ‘bang for your buck’. How Often Should I Feed My Birds? If you have a busy schedule through the day, free choice would probably be best. If you are available at set times of the day, you could easily go with fixed feeding. All birds get a chance to eat. Bully birds can’t ‘guard’ the feeders all day long. They can eat little and frequently, this is more natural for them. Less work for the keeper! Top up the feeders once a day. Rodents can get access also. 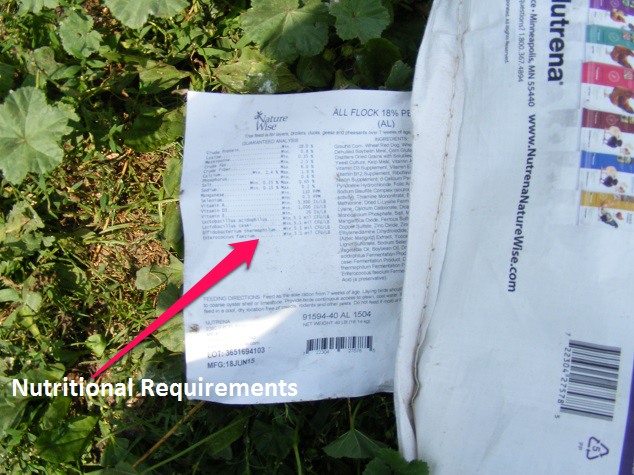 If feed is outside, it can get wet and moldy. Less wastage for rodents etc. Squabbling over feeders, some birds getting bullied. Somewhat inflexible, need to be consistent with times. I feed my flock as free choice. This way I find is more flexible for me. I top off the feeders in the evening so they have plenty to eat when they wake up. I also have a better idea of when I need to buy more feed. 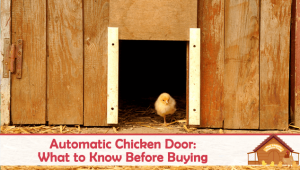 If you are raising broilers, they will need to have access to food twenty-four hours a day in order to put weight on. They will, of course, need lights to eat by. Organic feed is more expensive and usually a bit more difficult to find. 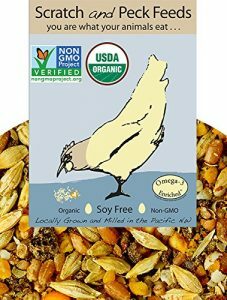 If however, you want to be sure that your birds do not have access to GMO feed, or you are going to be certified as an organic farm, you need to use organic feed. Organic feed does not contain antibiotics, animal byproducts, persistent pesticides or chemical fertilizers. Hormones are prohibited by federal regulations. 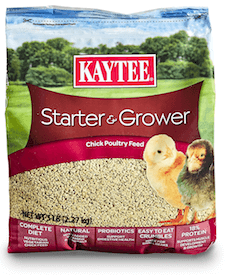 The feed companies also offer medicated or non-medicated starter for chicks. The medicated starter is treated with amprolium and sometimes antibiotics, to help as a preventative against coccidiosis. Note: If your chicks have been vaccinated against coccidiosis, then you should not give them medicated starter. If the feed is ‘medicated’ it will state this in on the packaging. On a personal note, I do not use medicated feed. My chicks are kept separate in clean quarters, so the risk of coccidiosis is small. They are introduced to the ‘outside world’ slowly so that they can develop their own immunity to coccidiosis. Many chicken keepers feed their flock fermented feed. What is that, I hear you asking? Any feed or grain that you can feed to your hens, can be fermented. In its simplest form, you add water, a little apple cider vinegar and around ¼ teaspoon of yeast to the feed and store it in a suitable container (not metal). Over a period of about 3-4 days, your feed will smell vaguely like a sour-dough. At this stage it is ready for your chickens to eat. Proponents of fermented feed say that it is more cost-effective and a bag of feed stretches much further. Why is this so? The fermentation process of grains actually releases many of the ‘locked in’ nutrients of grains. Seeds have a tough outer coating so that they can survive in a hostile environment until the time is right to germinate. Fermenting tricks the seeds into giving up their locked in goodness! We haven’t tried fermented food here yet, but it’s definitely something which we want to try next spring. 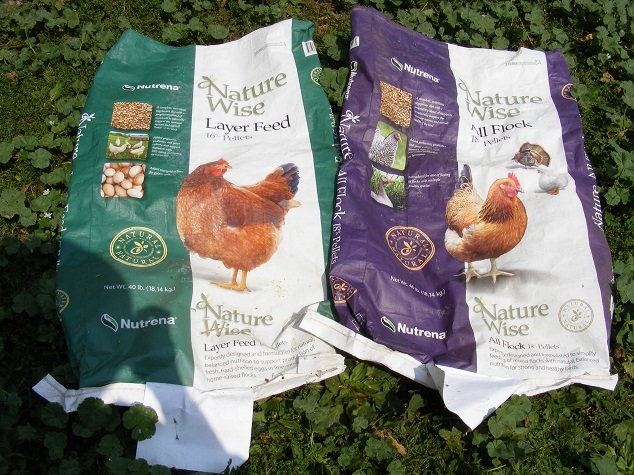 You are going to need to give your birds a couple of things in addition to regular feed. Calcium: In the form of crushed oyster shell, available from the feed store. Calcium assists the hen in laying a hard shelled egg, soft shells are indicative of a lack of calcium. You can also feed egg shells back to the girls. I ‘cook’ my egg shells in a low heat oven for about thirty minutes or so. This helps to destroy any salmonella that may be lurking in the shell. Crush them up and add to the oyster shell feeder. Grit: You can buy grit from the feed store. They also make chick sized grit as well. 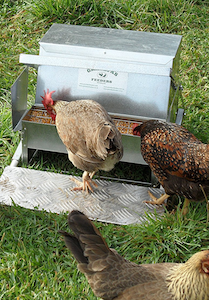 Grit is used by the hen to grind down their food. 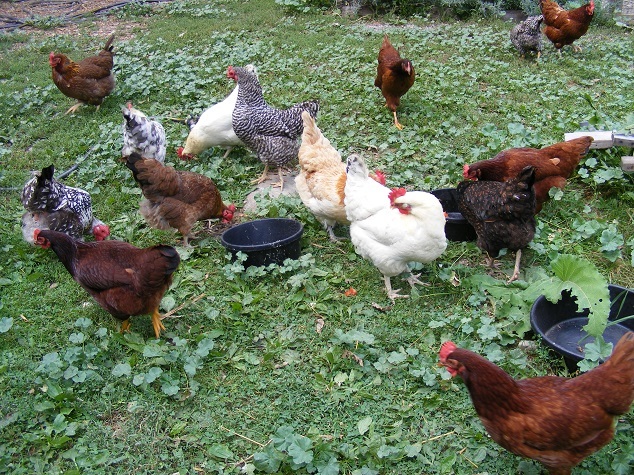 Greens: If your hens are pastured they will be supplied all the greens they need for a complete diet. If you are unable to pasture them, cabbage leaves, kale, broccoli etc. all supply the necessary green nutrition. Kitchen scraps: Squash seeds, tomatoes, melon rind etc. Make sure you read our previous blog post, stop killing your chickens, where we cover many of the things chickens should not eat. As you can see, there are several different choices for your birds out there. As long as they are healthy and active there really isn’t a ‘right or wrong’ in your choice of feed. What works for me may not work as well for you. I will be trying out fermented feed over the coming cold, northeast winter months. I will also be keeping notes as I go, so I hope to share those results with you come Spring-time! Let us know in the comments section below, what are your top tips for feeding your chickens? 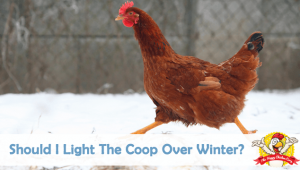 Should I Light The Coop Over Winter? Just wanted to thank you for having this site. We just got 16 Red Sexlings and I have learned a lot from you. My husband has had chickens before and I am teaching him new things. Thanks so much. Thank you Mary 🙂 Best of luck with your Sexlings! My chickens and ducks won’t eat layer feed any more . Any ideas what to do?